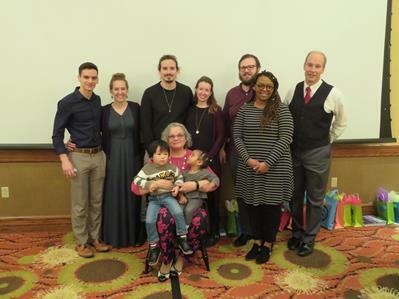 Chair winner Myrtle Holland with her family.The most prestigious award given by WVCTM is the Distinguished Service Award, presented to the individual who has done exemplary work statewide in mathematics education. The award includes a Captain’s Chair with an engraved plaque, hence it is often referred to as “The Chair” Award. The 2019 recipient is Myrtle Holland, a teacher Musselman Middle School in Berkeley County. Mrs. Holland is a National Board-certified teacher and was one of the first group of Project MERIT teachers. She helped take the state Math Standards through several different versions, revisions, and titles and has actively worked on textbook review committees over the years. A graduate of Ediboro University of Pennsylvania, with a Master’s degree from WVU, she has 37 years of teaching experience. Her list of accomplishments in the field could fill another page of text. Highlights include being a unit writer for Academic Innovations/WVU, serving as an SBAC Scale Score Panel member, being involved with Math Field Day, serving as a facilitator and author in WVLearns Online, and serving as Math Department Chair at MMS (2014-2016). She has served as the President and Middle School Vice President of WVCTM and was named the organization’s Middle School Math Teacher of the Year in 2012. At the recent conference, she was elected President-Elect of WVCTM. WVCTM Mathematics Teachers of the Year are those who exemplify the highest standards of mathematics teaching and provide a role model for their colleagues. WVCTM College Teacher of the Year Joseph WoodJoseph Wood was named as the WVCTM 2019 College/University Teacher of the Year. Wood is a professor at Glenville State College. Wood has worked on curriculum development at Glenville and works to develop grant proposals to improve mathematics teacher quality in the state. He helps students integrate technology into their work and is a regular presenter at WVCTM conferences. 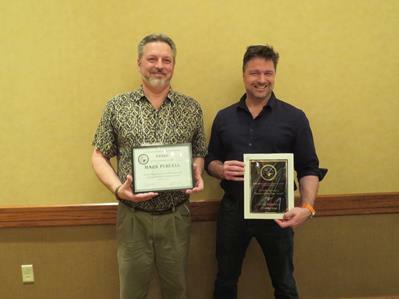 Mark Purcell was recognized as the 2019 WVCTM High School Mathematics Teacher of the Year. Purcell is a teacher at Parkersburg High School. 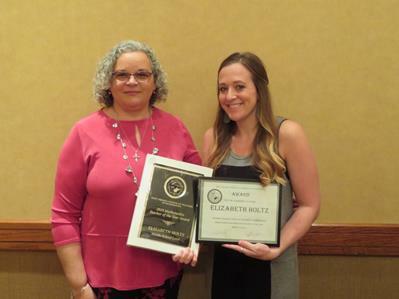 2019 WVCTM Middle School Mathematics Teacher of the Year Elizabeth HoltzElizabeth Holtz, a middle school mathematics teacher from Bridgeport Middle School in Harrison County, was named as the 2019 WVCTM Middle School Mathematics Teacher of the Year. Her nomination included the following statements: “She always co-plans with her fellow 7th grade math teacher to keep the curriculum the same. She finds new and fun activities to help the students learn the material. One of the best things about her teaching is the mnemonic devices she uses to help students remember math… The students love her and enjoy going to her classroom as well as seeing her at sporting events.” She also does morning intervention help and serves as head coach of the dance team at Bridgeport Middle School. 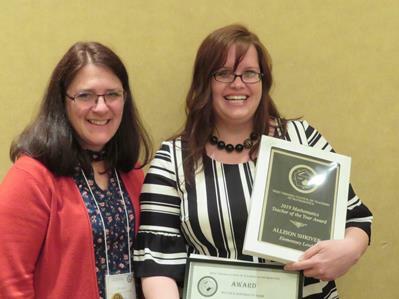 WVCTM Elementary Mathematics Teacher of the Year Allison ShriverAllison Shriver, a 5th grade teacher at Bradley Elementary School in Raleigh County, was named as the 2019 WVCTM Elementary School Mathematics Teacher of the Year. A colleague wrote that Ms. Shriver engages and challenges students in her classes and creates an atmosphere of excitement for learning, making math fun. The colleague specifically noted the Gallery Walks activity in which students work together to find the answer to a real world mathematical challenge, create posters, and display their posters for their peers. This activity engages students regardless of their level of ability. The West Virginia Council of Teachers of Mathematics congratulates all of the 2019 award winners! 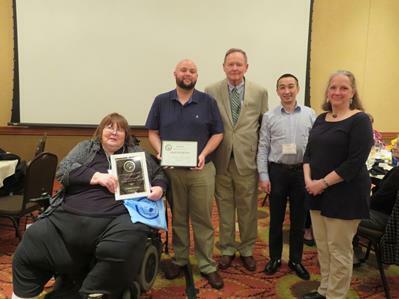 Make sure you nominate your deserving colleagues to be recognized at our 2020 meeting at Stonewall Jackson Resort in Roanoke, WV!